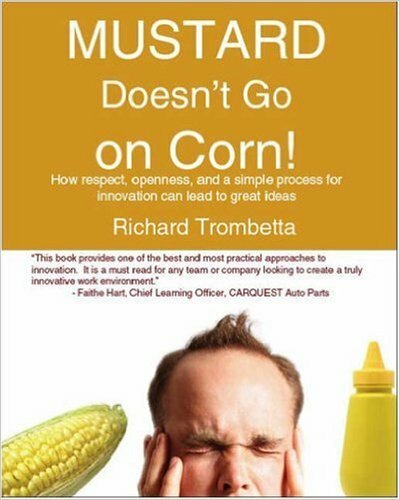 Mustard plus corn equals innovative thinking. Who knew? ﻿Mustard Doesn't Go On Corn! - how respect, openness, and a simple process for innovation can lead to great ideas was written by the President of The Innovation Company, Rich Trombetta. The book provides an entertaining, fun, straight forward, and practical approach to innovation. Using stories, examples, and evidence from research projects the reader will easily be able to quickly embed the concepts in the book into his or her team or entire organization. The result will be that EVERY employee will be constantly sharing and implementing new ideas. By creating what the author, Richard Trombetta, calls a POP! Culture and by following a process called NEWIDEA!, companies will become truly innovative and greatly improve their bottom line. The book shows how everyone is creative and that innovation is actually quite simple. Click on the PDF link Mustard_Story below to learn the story about the title of the book - it is awesome. Click on the PDF link Chapter_Two below to download a sample chapter from the book. Click the button below to download a copy for only $2.99 online at Amazon.com (Kindle version). If you have an iPad or other device you can download a Kindle app for free.